Happy Monday Everyone! 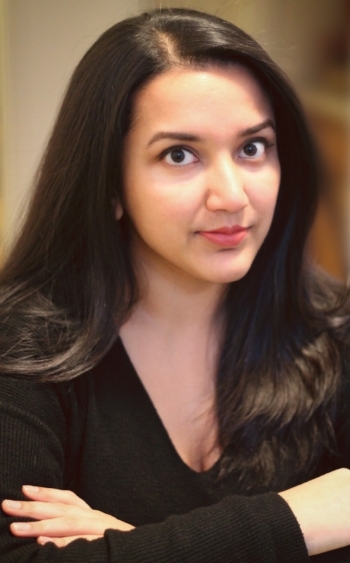 Today I’m excited to have debut author Swati Teerdhala here to share about her YA fantasy THE TIGER AT MIDNIGHT. It sounds like a real page turner with characters you’ll grow to love. It will be released April 23rd and I’m excited to read it. Hi Swati! Thanks so much for joining us. effective punishments was to say I wouldn’t be able to go to the library that week! Seriously, it would kill me. I wrote here and there since I was a kid, dabbling in darkly comedic plays in middle school and poetry in high school but it wasn’t until I joined the workforce after college that I started to write novels. I had worked for so hard toward a ‘good’ career and while I enjoyed it, I really missed being creative. I’ve always danced or sang or created art since I was a kid and for the first time, I didn’t have any outlet. I’d always wanted to write a book so I just started and then I couldn’t stop! 2. That would be a harsh punishment for me too. Where did you get the idea for THE TIGER AT MIDNIGHT? I first got the idea for The Tiger at Midnight when I was traveling and visiting an old Fort. It was the first spark of an idea of what would become The Tiger at Midnight and the first time I heard the voice of Kunal, one of the two main characters. I looked out from one of the old window openings and wondered what would be the most odd or startling thing a soldier of old might have seen. A girl. And that’s the opening page of THE TIGER AT MIDNIGHT. 3. Your story is based on Indian history and Hindu mythology. I met my husband in India, so I think I’m going to love your story. How much research did you do for it, and what advice do you have on research for a fantasy? A lot of the worldbuilding was pulled from my own direct experience and knowledge of India and Indian culture, being Indian-American. However, there was TONS of research required. While I grew up steeped in the culture and Hindu mythology, there was a lot I didn’t know or knew only one side of. I researched everything from the ecological topography of India to historically accurate clothing (the world is set in a fantastical ancient India). I’d advise anyone starting research to look for primary sources when combing through history and to always get multiple viewpoints. As for other research, make sure to look beyond Wikipedia. Get books from the library or scour old texts on Google Books. That was invaluable to me, as was asking my family in India to send me Indian texts as well. 4. That's great advice about using the library or Google books. It sounds like from the description of your book that the story is fast-paced and very plot driven. How did you plot it out, especially with Esha’a and Kunal’s misperceptions on their control of their situations? I’m a plotter by nature so I started out with a pretty clear outline before my first draft, one that focused on emotional beats and the budding relationship between the two of them. It wasn’t until the second, third, and fourth drafts that I added more intrigue and focused on pacing. I found the best way to do that was to think of my ending and find the most surprising way to get there (but also having plot beats that readers could anticipate!). 5. I love the advice to make getting to the end of a story as surprising as possible. Was it challenging to make Esha a sympathetic character with her role as an assassin? Why? In addition to being a spy and assassin, Esha is also a girl, which definitely made it more challenging to make her sympathetic. Esha is focused and ruthless, while also being loyal and kind. She was a complex character and the hardest part was making sure that complexity was apparent. Girls in YA are often labeled “unlikeable” if they’re not soft and retiring or more traditionally masculine. So balancing that line was important. 6. Your agent is Kristin Nelson. She’s always sounded like a fantastic agent. How did she become an agent and what was your road to publication like? Kristin is fantastic! I participated in #DVPit in April 2017 and Kristin liked my pitch. I queried her after that and from there, it was a pretty traditional process. I signed with her a few weeks later and then in the fall of 2017 we went on submission and sold! The whole process was a whirlwind of and I was so lucky to have an expert like Kristin by my side. 7. How are you marketing your book? Has your experience in marketing helped you at all with this? Working in marketing for my day job has definitely helped me understand how important and unimportant marketing is in the book world. I’ve mainly tried to focus on creating relationships with my readers, bloggers, and fellow writers through social media and events. While I did put together a preorder campaign, I did it more as a token of appreciation for all the people who are taking the time to support my book. My experience in marketing has helped me kind of keep things in perspective–but also to know where to put my time and effort in. 8. I saw on your website that you were a pitch war mentor in 2018. How did that come about? Share a bit how it can be helpful to have a mentor or be one. I love mentoring! My first experience being a mentor was for Author Mentor Match, which I absolutely loved, so it was natural for me to choose to be a Pitch Wars co-mentor with my friend, Roseanne Brown. Before being a mentor for Author Mentor Match, I was part of the program and was mentored by Axie Oh, author of REBEL SEOUL. She was such a vital part of helping me find the core of my story for THE TIGER AT MIDNIGHT and she was there through all the milestones of my publishing journey. While I don’t think it’s necessary to have a mentor, it’s wonderful to have someone who can guide you on your initial path to publication. 9. Now that your book is about to be released, is there anything that you wish you had known earlier or done differently once you knew that you would be published? Why? Not much, actually! Everything that’s happened has been a valuable lesson along the road. I would say I wish I had known how subjective publishing can be and how it rarely has anything to do with you personally. That was a lesson that took me awhile but is so important to know, especially as our novels are so personal to us. At the end of the day, publishing is a business! 10. Yes, it's very subjective. What are you working on now? Swati generously offered an ARC of THE TIGER AT MIDNIGHT for a giveaway. To enter, all you need to do is be a follower (just click the follow button if you’re not a follower) and leave a comment through April 20th. If your e-mail is not on your Google Profile, you must leave it in the comments to enter either contest. If you mention this contest on Twitter, Facebook, or your blog, mention this in the comments and I'll give you an extra entry. You must be 13 years old or older to enter. The ARC giveaway is U.S. I totally understand Swati's love of the library! That would have been quite a punishment for me, too. Great tips on research. Congratulations on the upcoming release! Good interview, Natalie and Swati. I love stories of female warriors. In a different life, I would want to be one. Sounds like a fascinating story. Love the title! Great interview, as always, Natalie! I'm so impressed that despite her own background as an Indian-American, she did tons of research. Bet it shows beautifully in this fascinating-sounding novel. Congrats, Swati! You make a great point that even though you know some things about the culture, research can make all the difference. Sounds like a fabulous adventure! Adding to my wish list! Thanks so much for the interview. I enjoy reading tips from authors. The mentoring experience sounds wonderful. Nice interview and congratulations! Love the title. Thanks fro another interesting interview. I will pass on the giveaway. Buried in books here. Sounds like she did some fascinating research to get the details just right and appreciate the multi-view point she suggested. I will pass on the giveaway, busy as a bee, but hope you're having a lovely week Natalie. I'm so so excited for this book. PS, I'm not in the US, but will happily pay the shipping costs. I'm excited to read this one! Thank you for the giveaway.